We had 3 students travel from Utah, New Mexico and Tennessee for private kicking lessons at our home field of Coronado High School just minutes from downtown San Diego. It was a crazy week at Kicking World headquarters in San Diego, California. We had 3 students travel from Utah, New Mexico and Tennessee for private kicking lessons at our home field of Coronado High School just minutes from downtown San Diego. More and more students and families have been coming out to Southern California because it allows them to get in kicking workouts and turn it into a mini family vacation. San Diego California has been consistently rated as one of the best climates in the world and top 5 tourist destinations in the country! For our July San Diego kicking camp at La Jolla High School over half of the campers were from out of state! 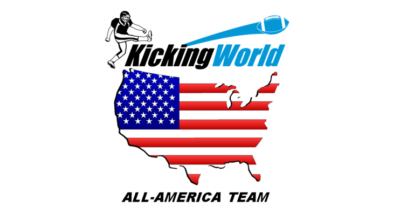 It’s an increasing trend to see out of state kickers make the trip to come work with Kicking World during the summer school break months. My first kicking lesson was with Austin Barker, Junior Kicker of Dixie High School in Utah. Austin is an excellent young kicker who shows college kicking potential. We made very minor tweaks in his form that resulted in drastic results! Take a look at his YouTube Video (below) which shows him blasting 50 yard field goals doing a one-step field goal approach! His timing, consistency and distance increased significantly in the 2 day kicking lesson. We also were able to improve his kickoff steps, tempo and accuracy as well as get him nailing the pop up onside kick! It was a good time working with him and I know he’ll be one of the best kickers in Utah this year. Keep an eye out for Austin Barker of Utah! My next out of state private kicking lesson this week was with William Bane, Beginner Sophomore Kicker of Tennessee High School in Tennessee. William has played soccer for a long time and only began field goal kicking a few months ago. He basically learned all he knew from watching games on TV and with limited kicking instruction from his football coaches who don’t really know a lot about kicking. William came to me with a goal to learn the fundamentals and basic techniques needed to kick consistent extra points and even be able to make some field goals. At the start of the kicking lesson I was skeptical because he barely was reaching 20 yard field goals (PATs). By the end of the 2 day kicking lesson, with much needed adjustments on his steps, foot to ball contact, and follow-through we were able to get him consistently making 30 yard field goals. It was very rewarding for me because we only spent an hour and a half 2 days in a row so to make these strides in only 3 hours together is a big accomplishment in itself. I know he’s excited to go back to Tennessee with all the new kicking knowledge he learned. I wish him the best and hope he can be a relied upon extra point and field goal kicker for his Junior Varsity team this year! My last out of state private kicking lesson of the week was with Nash Phillips, a Junior Kicker from Albuquerque Academy in New Mexico. Usually the problem with most kickers is that they can’t get their kicks high enough in the air. This was not the case with Nash! In fact, Nash was kicking the ball so high when I first saw him. His kicks were going straight up in the air and although he definitely had the leg strength to make 50 yard field goals, he was falling short on 40 yard field goals because of the trajectory of his kicks; the balls were getting sucked up by the wind and losing a ton of distance! Because Nash had a very strong leg already, I didn’t want to make too many tweaks to his form. We did however make minor adjustments that allowed him to do 2 important things: 1. Hit the sweet spot of the ball (a bit higher than where he was striking before) and 2. Make good foot to ball contact (he had a lot of mis-hits where his foot impact position was down by the toes sometimes or way down low like a soccer pass). By the end of the 1 day (1.5 hour lesson) we were able to get all the kinks out and get him driving the ball with a penetrating flight while still being high enough to avoid blocked kicks. He went from just missing 40 yard field goals to just making 50 yard field goals in only 1.5 hours! These are above average results and not everyone can expect to add 10 yards on their kick overnight! But fortunately for Nash, he had the leg strength and leg speed already but just needed guidance on where to strike the ball and what to do with his body at and through impact! Nash had such a good time that he also came back for the kicking camp in San Diego. He was able to master the onside pop-up kick (as witnessed by the photo in this blog) and gain considerable distance on his field goals. If he remembers to strike the ball in the right spot with the correct part of his foot every time, he will be a deadly accurate and long field goal kicker! I wish him the best out in New Mexico! If you’re wondering ‘How do I get private kicking lessons with Coach Brent in San Diego or Orange County, California?’ Simply signup online and then call or e-mail me to schedule a time that is convenient for you and your family. I work with some of the best youth, high school and college kickers in Southern California from Los Angeles to Orange County to San Diego. More and more students are choosing Kicking World because of our commitment to success, passion for kicking and fun and challenging training sessions. If you’d like to come out for a day or two of kicking and live out of state, don’t let that hold you back! Give me a call or shoot me and e-mail and I’d be happy to schedule you in for private kicking lessons in San Diego or Orange County, California. I wish everyone a very successful training camp and upcoming football season!